Go through the right-hand door first. Notice the chests and pots form a smiley face. :-) Anyway, the chests contain 20 rupees and a Map. Blow down the wall for two more 20-rupee chests. Now go back to the previous room, hit the crystal, and go through the upper left door. Ram into the lamp to knock down the Small Key. Use it to unlock the door. In the next room are conveyor belts and several of those jellyfish things. Head through the top-right door. Grab the Small Key, hit the crystal and head through the bottom door. In the next room, head to the right. Hit the crystal and head back left. Open the chest for the Compass! Go back through the right-hand door. Now get out your Boomerang for the next bit. Hit the crystal, move below the block, hit the crystal again, head into the barrier, hit the crystal and lift the pot for the Small Key. Use it on the door and go up. 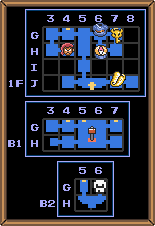 Kill the Helmasaurs and light the torches to make a chest with the Big Key appear. Bomb the left-hand wall for the Blue Mail. Now go back and down the stairs. Head to the left. Head down while avoid the spitting statue and open the chest for the Magic Hammer. Use the Flute to warp back to the entrance. From the entrance go left (hit the crystal if necessary) and hit the pegs if you want 210 Rupees, otherwise head back towards the room with the hole and the conveyor belts. Once there go through the top-left door. From G-4 bomb the walls until you come around to H-4. The thief there will trade a mere 50 Rupees for the ability to carry an extra ten bombs. He'll also refill your bombs. Use the Hammer to defeat the shell creatures. Bomb the left-hand wall between the pots if you want 200 Rupees, otherwise just get the Small Key from under the upper pot. There's nothing more here, so return to the conveyor belt room. Hit the blocks and fall down the hole. See that greyed-out teleporter? If you fall into the large vase just to the right you'll find some fairies. The teleporter returns you here. If you want 300 Rupees head to the bottom right from here and bomb the wall. For 150 Rupees go to the bottom-left platform and bomb the left-hand wall. When you're ready to face the boss, hit the blocks and head up. Go down the stairs, through the door and then through the next one to fight the Helmasaur King. 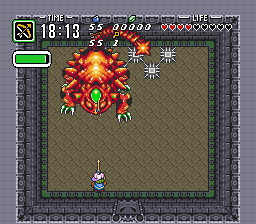 Fight him exactly the same way as in A Link to the Past: use the Hammer to break his mask, then shoot the crystal on his head with the Bow; it takes eight arrows to kill him. Collect the Heart Container and Tablet, and you can leave the dungeon. This page was last edited on 20 January 2012, at 10:23.